The mention of money, budgets, debt, saving and spending can send some of us into a state of panic. Do any of these emotions sound familiar at the mention of money? fear, guilt, shame, anger, judgment, victimization, despair, stress, hopelessness and wanting to just run away. Money management and financial planning are challenging to just about everyone – whether they have a lot or a little. A big reason for the struggle is most people have no clue as to where they even stand financially. The first step toward finding financial freedom is to get a clear picture of your current financial situation then make a concrete spending plan. When you eliminate the guess-work, you alleviate the stress each month when it’s time to pay your bills. There is light at the end of the tunnel and the more you know about your money, the less you will think about it. 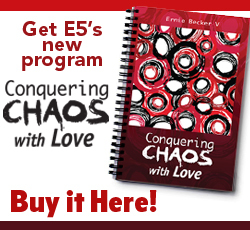 E5 Coaching has budgeting tools and hands-on planning experts to walk with you through a simple process that can help restore financial harmony in your life.